Slotland.com’s new Tetris-like online slot machine is two games in one, both inspired by the popular game of falling-blocks considered by some to be the best video game ever. 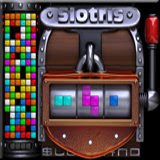 The wheels on Slotland’s new Slotris online slot machine spin the familiar multi-coloured cubes and the same squares fall into place on the grid of the adjacent bonus game puzzle -- just like the video game that has mesmerized millions for decades. There are two ways to win Slotland’s new game, Slotris. There’s a traditional three-wheel single payline slot line with spinning symbols –coloured blocks rather than cherries. When three matching symbols line up, the player wins. But the coloured boxes don’t just spin on the slot machine wheels. Afterward, the same symbols fall into place in the grid beside the slot machine. Players can win this bonus game by guiding the blocks into place. Every solid-colour line multiplies the player’s bet and ten lines wins the jackpot. Like all Slotland online slots and video poker games, Slotris is tied to the Slotland progressive jackpot – known for being frequently hit for amounts well over $100,000. Recently it was hit for almost $200,000 and a $116,332 jackpot was just won in December by TRILIGHT33. The new Slotris game makes 10 unique slot machines and video poker games for this pioneering online entertainment site. Six of the most popular web games are also available on mobile phones. Slotland has earned the trust of players all over the world and takes pride in their reputation for excellent customer service and quick and easy withdrawals of winnings.